When Firefox 49 shipped it contained the Cache-Control: Immutable feature to allow websites to hint which HTTP resources would never change. At almost the same time, Facebook began deploying the server side of this change widely. They use a URI versioning development model which works very well with immutable. This has made a significant impact on the performance of Facebook reloads with Firefox. It looks like other content providers will adopt it as well. The benefits of immutable mean that when a page is refreshed, which is an extremely common social media scenario, elements that were previously marked immutable with an HTTP response header do not have to be revalidated with the server. Lacking this hint, the browser needs to guess which objects may or may not change on reload – wasting time on one hand or risking website incompatibility on the other. 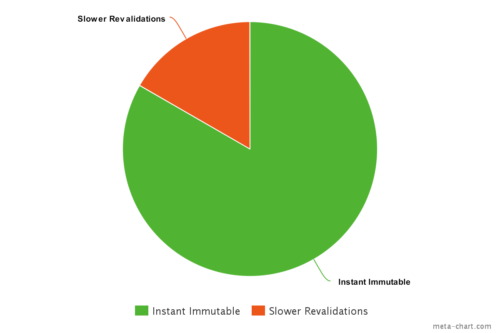 For smaller objects, the work of this revalidation via a 304 HTTP response code can be almost as much work as just transferring the response fully. For Firefox users reloading Facebook content this has been a tremendous boon – the fastest request is one that is never made, and that is exactly what happens over and over again when refreshing a Facebook page. In my testing a typical feed may initially be comprised of 150 different resources. Pressing refresh in Firefox 49 generates just 25 network requests. As you might imagine, this radically speeds things up. In my testing, it can often cut page reloading time in half. Facebook was also an early adopter of the brotli compression encoding. They use that to reduce the bandwidth usage of the dynamic markup, which cannot be cached, saving around 20% of the bytes transferred when compared to the older gzip standard. Brotli has been available in Firefox since Firefox 44. Facebook’s servers are big winners too of course – a request never made saves bandwidth and CPU utilization which can in turn be spent on making the site faster for other requests. Facebook has been a great partner in this effort. Lately I’ve been spreading the word about immutable and other developers are adopting it too. Anecdotally, BBC sees reload times improve up to almost 50%, and finds 90% of requests are optimized away by immutable. This has enough experience in the wild now to heartily recommend its use. To ensure adequate documentation it has also been adopted into the IETF on the Standards Track. All you need is a proper caching header to get started with your development. You know something is wrong when a statement like this is said with the expectation of sounding impressive. I’m glad we’re tackling the over-fetching of resources and the slowdown it causes when loading up pages. “Expires:” was supposed to do just that “immutable” is described in this article. But somehow neither Mozilla nor other browsers are respecting the expiry date and keep revalidating the resources despite having a date in the future. It sounds from what you wrote that it was a design choice so that website poorly written would not suffer issues with incorrect configuration of the expiration date.
. Again the browsers started to disregard the cache when refreshing pages in order to circumvent bad website configuration of the cache-control header. Is immutable going to suffer the same fate as the previous two attempts? If websites start to abuse the new value and things start to break as a resource of stale resources, will Mozilla (and other web browsers) start to revalidate the resources that had already been said to be immutable? I think any form of caching is a good way to stay reprovable on the internet. Facebook is a huge data drain for those of us in third world countries, or in first world countries with third world internet (take a bow New Zealand) ! Our Pacific Islands charge some of the highest internet rates in the world, while suffering some of the lowest pay rates – at least among those lucky enough to get pay at all. As in most countries, Facebook is hugely popular in the islands, given the importance of family first, friends second and ‘face-toface’ communications third. So data savings of 50% would make a huge difference to people there. Do you know if this cache feature is deployed worldwide, or, as usual, first-world first, third-world last? This is overridden with CTRL+F5, yes? yes, that style of ‘hard reload’ is used to fix corruption. We never did revalidation under those circumstances (because you often just revalidate the corruption if the etag part is right – so you do a full non conditional reload instead) so its behavior is unchanged. Can you explain the difference compared to the existing `Cache-Control: public` without must-revalidate? It seems to me that combined with a high max-age, the effect should be the same. The core concept is that without immutable the concepts of fresh and current are not clearly separated. http caching allows for fresh (i.e. cache replayable) data that isn’t the most current representation of a resource – and of course firefox normally uses that. But when you press refresh we in the past have revalidated even fresh things (i.e. with a high max age) to check to see if they were still the most current. immutable lets the cache know that there is never more than 1 version of that resource, so we only need to worry about freshness and never re-validate under those circumstances. But a max-age of 1 year (for example) should be close enough to being immutable. No sane site would use that for resources that actually do change. Imagine how a support department is going to explain that the site looks messy but that you expect it to be fixed in at most 1 year. Or think of the way you as a developer would explain it to your own support team. Or what happens if another change is made during that year.. etc. etc. Immutable is explicit and that has some merit, but long max-age without fuzzy magic heuristics should already do the trick. Immutable might look like KISS, but wouldn’t it be even simpler if max-age was just respected? Also, less random code. > But when you press refresh we in the past have revalidated even fresh things (i.e. with a high max age) to check to see if they were still the most current. Very well written. Your article explains about the benefits of using immutable caching for improving the webpage reload time. Could you also help me to understand how to implement this in the code base. Amazing work Moz://a! The faster we can make the web the better. Out of interest are you aware of any articles that are covering the implementation method required to achieve immutable? I’m also unclear the exact reference meaning for ‘immutable’ and ‘never change’… is it absolutely literal? Thanks for your patience on the basic questions, but I want to make sure I understand the full ramifications of the approach. What is the advantage of this versus the old YSlow guideline of setting far future expires? If you set far future expires for 50 years into the future, does setting Cache Control: Immutable provide any additional benefit? My co-worker pointed out that I missed comments above that answered this question. This is one time I should have read the comments. Sorry about the duplicate question. I’m excited about this new option. And anxious to this in the next time. @Tara: it means that if your company is unable to keep track of its resources to update them and you care about them updating in a timely manner, they you should not use headers meant for caching. You’d be better off just using etag, which provides the revalidation based on content and not timestamp. So, what’s the plan for the next header, after this one gets so abused and ignored? fwiw I disagree that this has anything to do with old attributes being ignored. They always failed to distinguish between fresh and current – immutable allows that. Why does this only work for https and not http? Is there any benefit to adding the immutable cache header for assets which include a unique hash in their filename and are served with a max-age of 1 year? On the app that I work on, all assets are hashed and the hash is included in the filename. When requested, the response is always 200 and served from cache. Would an immutable cache header improve this any further, or is this meant to optimize static assets with static filenames and low max-age values? yes – immutable lets you distinguish between just fresh (max-age) and fresh and current (max-age plus immutable). If the resource is known current you don’t need to revalidate it on reload. note that reload (the reload icon, or shift r) is not the same as simply reuse – for which fresh is sufficient. This is all about explicit reload. Ahh good to know. Thanks for the quick response. I wonder if this might help speed up out automated tests by serving content a bit more quickly. Im not sure what kind of refreshing goes on between each of selenium’s tests. Seems to me that partnering with Facebook isn’t such a great thing these days in terms of “privacy.” It’s become too popular, and Firefox seems to start becoming too popular, too. But I hope I’m wrong.